At a recent festival in Belgium about Europe-wide cultural solidarity, artist and AIR Council member Joseph Young talked about a-n/AIR's Paying Artists campaign. He reports on a debate characterised by politically outspoken artists and networking over mojitos in the Che Guevara tent. 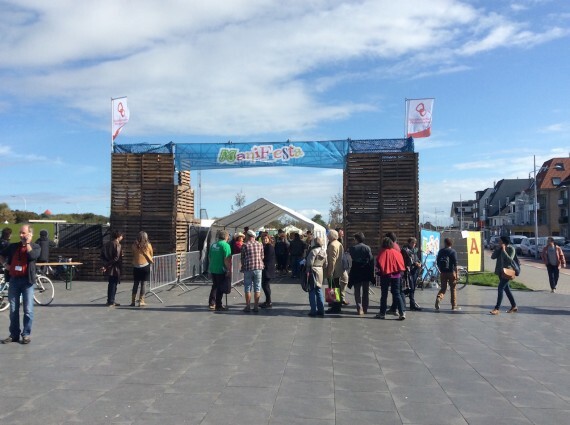 On the outskirts of Ostend, a new ‘festival of solidarity’ took place recently, funded and co-organised by Solidaire (the weekly newspaper of the Workers’ Party of Belgium, PTB) and Medicine for the People. Spread over a large site of marquees, public buildings and impromptu stages, the two-day ManiFiesta festival of debate, music, theatre and literary events offered a unique celebration of all things radical. Tailored very much towards a family-friendly audience, it’s hard to imagine a similar event happening anywhere in the UK. I attended on behalf of AIR Council to talk about the Paying Artists campaign in a debate about cultural solidarity. The other speakers on the panel were extremely diverse, representing established trade unions through to smaller artist-led campaigns, and each speaker was given a chance to present his or her organisation. The debate then moved onto the wider topic of the impact of austerity on culture across Europe, a situation characterised by deep funding cuts even in countries such as Holland, previously associated with generous public subsidy regimes. The session was chaired by Robrecht Vanderbeeken, a post-doc researcher from the University of Ghent who is currently working on a book about establishing a ‘fair trade’ mark for the arts. This was perhaps the most interesting part of the debate, going beyond the inevitable diatribes against austerity and the rather depressing stories of funding cuts and closures. Difficult to define and large in scope, the idea that various interrelated matters of funding, artists’ pay and good practice could be bundled together under a fair trade banner, as a way to focus a public campaign, provoked intense discussion, with some fair measure of agreement over its usefulness. Certainly in the context of Paying Artists it is something that has already been extensively discussed – with the idea of a ‘name and fame’ approach to the awarding of a ‘kitemark’ for galleries that pay their artists fairly. Interestingly, this proposal is overwhelmingly supported by artists but is less popular with the galleries themselves. Some examples of innovative campaigning techniques were shared by the artist Rune Peitersen from Platform BK in Holland, which, despite its relatively small size, has managed to counter recent negative press in the country, characterising artists as scroungers and subsidy junkies. Platform BK’s rapid response volunteer media team have successfully combatted this through a campaign of article and letter writing, shifting the focus of the debate onto the value of art and artists. This despite them having little or no funding to support their work to date. Cecilia Lisa Eliceche from Belgian artist-led campaign State of the Arts highlighted the value of artists campaigning together alongside public sector unions in opposing austerity, seeing the plight of artists as part of a wider movement rather than in isolation. Perhaps unsurprisingly, given the context, there was a lot of talk of the evils of neo-liberalism, with certain tenets taken as read: austerity has failed; the public sector needs more investment; neo-liberalism as a global movement was started by Ronald Reagan and Margaret Thatcher in the 1980s and continued by Tony Blair in the 1990s. Indeed, the overall tone of the debate would perhaps have surprised an English audience, unused to its artists being so politically outspoken. For me, all this talk of solidarity will come to nothing if artists cannot capture the public mood across Europe to bring about the change that is desired. Otherwise it’s just comrades talking to comrades. After the debate, in the early autumn sunshine, we shared business cards and contacts over a mojito in the Che Guevara tent, accompanied by a live salsa band. Now, that’s what I call revolution!